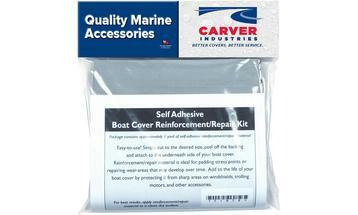 Our self adhesive boat cover reinforcement/repair kit contains one square yard of self adhesive material. You simply cut the material to size, peel the backing off, and stick it on the inside of the cover. The material is designed for reinforcing areas where you may have sharp edges, or repairing areas where you have experienced wear.